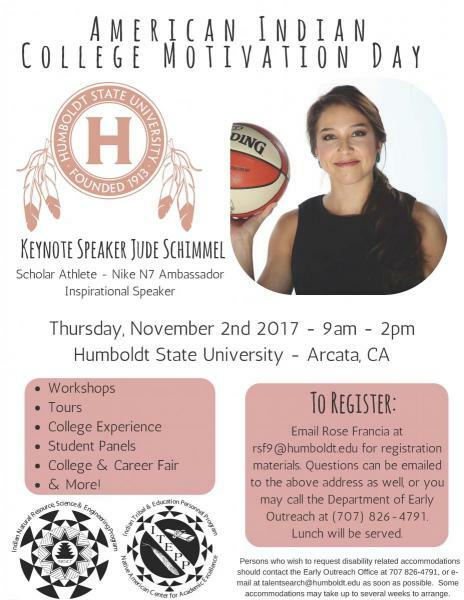 Join us in celebrating the 44th American Indian College Motivation Day at Humboldt State University! Approximately 400 high school students from 30 schools throughout Northern California will attend the event. This year's keynote speaker is will be announced soon. As in the past, this year’s conference will be filled with a variety of campus tours, ​workshops, lectures, and special presentations aimed at increasing the representation and success in post-secondary education and degree completion for Indigenous People.